We really like the terroir of Vinsobres, a beautiful village located 40 kilometres north of Châteauneuf du Pape at an altitude of 300 metres, primarily on terraces. Vinsbores is particularly suitable for Syrah, giving it that great finesse we tend to loose further south. Back on this very technical vintage with great potential. 2017 began with a particularly dry and mild winter, resulting in a precocious vine. After a sudden drop in temperatures in the early spring with severe frost in several areas, temperatures rose again well above seasonal averages. The flowering was fast, with important and extensive shatter on Grenache and Carignan. The vineyard, however, remained very healthy. The summer was exceptionally hot and dry, leading to a very early start of harvest in mid-August. Harvest lasted until October 5 with ideal conditions, alternating hot days and cool nights. The cellar work was very technical and precise and the first tastings reveal wines with a great potential, very well balanced and aromatic that should be among some of our best vintages. The most northern vineyard of the southern Rhône. The Perrin family owns around 60 hectares in one single plot in Vinsobres. The average altitude is 300 metres on hills and terraces. Stony and sandy marl on the slopes, stony quaternary alluviums on the terraces. The entire harvest is destemmed. Syrah is vinified in wooden truncated tanks that are punched down and pumped over. The Grenache is vinified in stainless steel tanks. The Syrah is partly aged in one year old oak barrels. Blending takes place after malolactic fermentation. A great vintage for Vinsobres in 2017. Great elegance, it reveals all the richness of its soil, marked by beautiful Syrah on limestone. Well balanced and complex in the mouth, it offers a nice acidity, freshness and a hint of bitterness reminiscent of limestone. 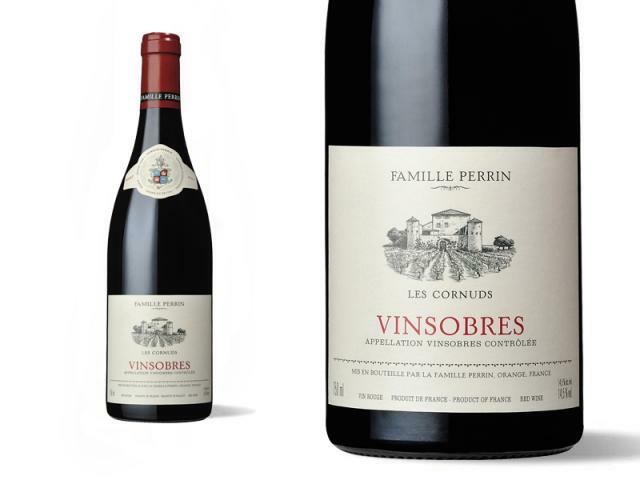 "“The 2017 Vinsobres les Cornuds is a 50-50 blend of Grenache and Syrah, grown in one of the northern and higher appellations of the Southern Rhône. This medium to full-bodied wine combines the positive attributes of its varietal components, offering cherry and blueberry fruit, ample concentration, supple tannins and a finish that boasts hints of violets and dried spices. 2018-2023.”"
"Based on 50% Syrah and 50% Grenache, the 2017 Vinsobres Les Cornuds sports a deep ruby color as well as a gorgeous nose of cassis, blackberries, ground pepper and violets. The Syrah is dominating at the moment, and it hits the palate with beautiful purity of fruit, ripe tannin, and a great finish. It's one seriously good barrel sample."